You may have hesitated when you have read the topic for this post, which is : how to give yourself a fever? I agree that it would be improper to fake your febrile condition. However, there may be some instances in which you’re forced to do it, because of inevitable circumstances. There are various instances when you have to pretend you’re sick because you have to. An example is when you have a shameful family problem that you have to attend to - ASAP (examples: AIDS, infidelity, and similar incidences) and you cannot reveal this to other people; thus, you have to pretend that you’re ill, so you can go home early and help resolve the issue. With that said, let’s now proceed in answering the question: How can you give yourself a fever? First, What is a Fever? A fever is a condition when your body temperature becomes elevated from the normal, which is 36.5 to 37.5 degrees Celsius or 97.7 to 99.5 degrees Fahrenhei﻿﻿﻿﻿t for adults. However, for children, 37.5 may be considered as slightly febrile. Any body temperature above the normal is considered febrile. So, how do you give yourself a fever? Here’s how. This can warm your body and cause you to sweat, which is one of the symptoms of fever. Drink hot liquid frequently - when it’s nearly time to measure your temperature. You can drink hot milk, coffee or hot water. There are certain foods that could raise your body temperature. Typically, these are spicy foods, such as jalapeno, dishes with red pepper, and peppercorns. Exercises generate body heat, so you can do some exercises that would help increase your temperature. Don’t overdo it though, because you may sweat profusely, which would lower your body temperature. Nevertheless, a little sweating can mimic the symptoms of fever. Keep your body temperature warm by wearing layers of clothing. If you’re at home, you can cover yourself with thick blankets to increase your temperature. Again, when you feel yourself sweating, remove some layers. Hence, do this right before the measurement of your temperature. Another alternative is to wear thermal clothing overnight. This can be a night shirt, vest or dress that has the ability to heat your body. Of course, you should not advertise that you’re wearing one. When you wake up in the morning, your body temperature should be higher than normal. Ginger increases the temperature of the area where it’s applied on. Wash the ginger thoroughly and crush it, then apply it overnight or for a few hours before the temperature measurement. You have to attach the ginger tightly into your armpit with a long clothing, arm sling, or gauze bandage. Make sure the ginger is anchored into the raw skin of your armpit properly. This would increase that area’s temperature. You can also apply onions in your armpits. It has been reported that when onions were used in the armpits, they could increase the temperature, when taken on that exact spot. You may also leave the onion in your armpit overnight to enhance its action. Ascertain though that you don’t smell like onions in the morning. Use a lotion or cologne on your arms to mask the smell. This is a direct easy way to fake your fever. 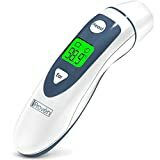 If someone takes your temperature, and you’re not sure if your method is effective, you can heat the thermometer directly to raise the temperature. When the person places the thermometer into your armpit and leaves you, you can immerse the thermometer into the cup of hot water and return it to your armpit before the person returns. Take note that the water must not be extremely hot, or the thermometer might break. If it’s a mercury thermometer, the poisonous mercury might spill and endanger your health. Mercury is an extremely poisonous substance. You can also rub the thermometer tip (bulb) between your fingers to generate heat and warm up the measuring tip (bulb) of the thermometer. 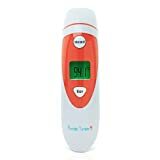 This would increase the thermometer’s reading. Also, you can place the tip of the thermometer against a light bulb to raise its temperature reading. If the person doesn’t leave your side, you can make an excuse of going to the comfort room. Make sure, you have a hot water in there, so you can immerse the bulb of the thermometer for some minutes, before returning to your room. Don’t shake the thermometer because this would lower its readings. Return it to your armpit before going back to the room. The dark circles in your eyes and your lack of vigor can make you appear sick. Getting insufficient sleep can also elevate your temperature. Since you’re faking your temperature, you must know the symptoms of fever, so you can also mimic these symptoms. This is not usually demonstrated at the onset, but you can let yourself sweat on the forehead. Bear in mind that when you have sweated, your fever should have been reduced. You can complain vocally of a headache; simply say: “My head seems to be splitting in two” or something to that effect. Show that you’re shivering when you start to sweat. Don’t shiver when you still haven’t sweated yet. You may say at the onset that you feel cold, and then hunker into the folds of your clothing or blanket. Complain of stomachache and your face must mirror the pain. Don’t complain of stomachache, while your face is expressionless. Generally, people with fever have no appetite for food. Hence, don’t gorge yourself with food, when you’re supposed to have a fever. You have started the facade, so you must, as well, do it properly and convincingly. Your lips are supposed to be dry and cracking. Thus, don’t apply any lip balm or lipstick. Your face should reflect what your body is supposed to be suffering from. This may not be a common symptom, but you can fake a hoarse voice to add credibility to your fabricated illness. You could shout repeatedly in the bathroom before the ‘sickness’ to make your voice hoarse. Although, this is not a common symptom that occurs with fever, it can happen in certain instances. Since, no one can tell for sure whether you’re having diarrhea or not, it’s one perfect illness that you can fake, together with your fever. You can complain of diarrhea and go to the comfort room several times. Stay there for some minutes. Make sure that when you come out of the john, you’re clutching your stomach in pain, and your face is in a grimace of agony. Show that your body and muscles are weak by walking unsteadily with your knees seeming to buckle underneath the weight of your body. Your body language can speak volumes of your physica﻿﻿l condition, so consciously act like you’re genuinely sick. If you think being honest with your boss or the person in authority is the best option, then don’t pretend to be sick. It can become a bad habit. Don’t pretend to have fever just to escape from a responsibility. This would not develop your character, and you’ll be at a disadvantage, in the end. If you have decided to give yourself a fever, do so convincingly, so that all will not be in vain. Take note of all the symptoms mentioned above and mimic them properly. Don’t overdo your symptoms, or they will have the opposite effect. Instead of appearing genuine, they will appear contrived. These are the 10 easy ways on how to give yourself a fever. They are strategies that you can utilize safely - if you have a valid reason to do so. If you don’t, then don’t even start thinking about it. Faking a fever is easy, but fabricating more things to support the notion that you have ‘fever’ can be tedious. To cover for a lie, you have to continuously lie, and you may eventually end up acquiring lying as a habit. Thus, be wise and use your conscience when deciding. If you have a similar experience, you may want to share it with our readers. I’m sure it would be a learning experience for them, as well.